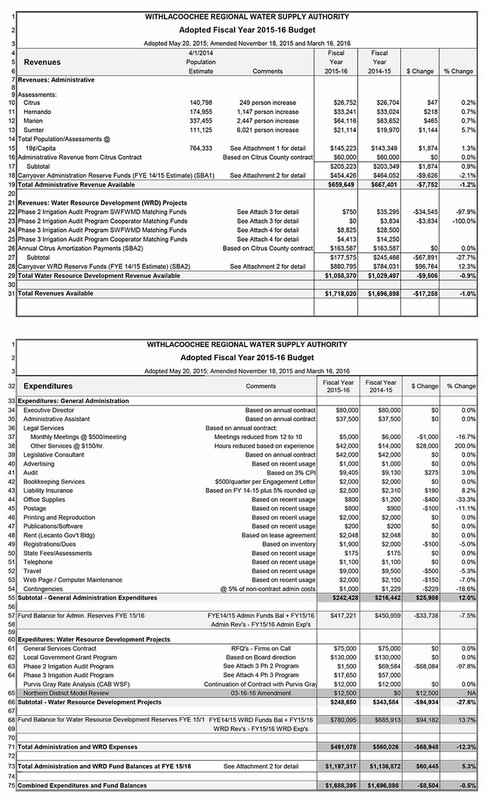 The WRWSA Board of Directors approved an amendment to the FY 2015-16 Adopted Budget at its March 16, 2016 meeting. The purpose of the amendment was to transfer $12,500 from the Fund Balance for Water Resource Development Reserves to a new line item "Northern District Model Review". This transfer was to allow for the Authority to participate with Marion County in the technical review of changes being developed by the SJRWMD and SWFWMD to the Northern District Groundwater Model. Contact wrwsa@wrwsa.org for Attachments 1-4.